Breadth Indicators – Useful or not? Be careful when using breadth to measure the health of a market. 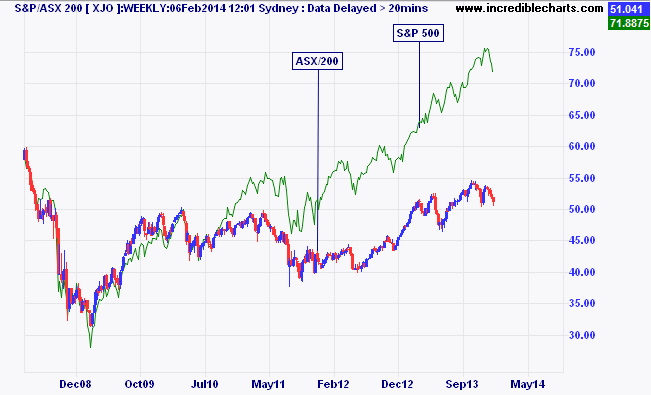 Whilst the Stockradar (breadth) Index has diverged since 2012 in a compelling manner, it hasn’t helped us make money. It tells us the big caps have taken the index up, rather than the market as a whole. But we still want to be invested in the names moving higher. Negative breadth is a warning sign, at best, and not a viable trading method.The chart above looks at various breadth indicators on the US market to see what is happening in the S&P 500.Most breadth indicators are based on the number of advances versus decliners. Breadth becomes more useful when extremes are reached. 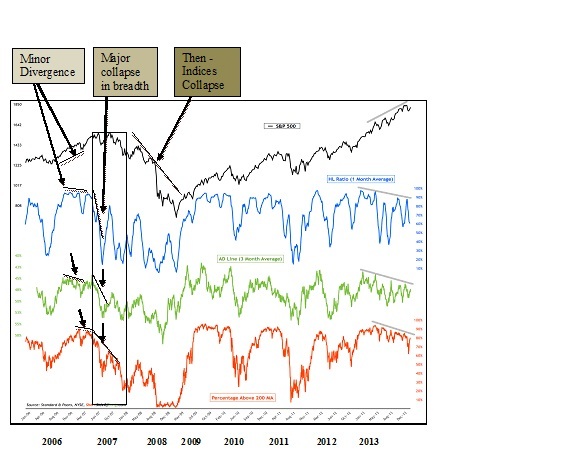 Since 2012 all the breadth indicators, including the Stockradar Index, have been diverging with the major indices, as the “big caps” do the heavy lifting. But it is the major declines in breadth, not the small divergences that tip the indices. See the areas highlighted on the chart above. The minor squiggles in divergences are not significant and do not precede significant market falls, but when the breadth indicators fall away sharply, as they did in early 2007, the market collapsed shortly thereafter. Momentum indicators such as RSI and MACD work in the same way. They also diverge as upward acceleration slows, or rapid momentum expansion simply cannot be maintained. This doesn’t necessarily mean you should sell; it is just a slowdown in the trend. Most momentum indicators have a mid-point of 50 or 0, which provides a more reliable trigger when violated.It is imperative to objectively analyse each stock on its own merit, on its own trend attributes.Of course, we’d like to see broader participation in the ASX/200 rally, especially from the small caps – the Stockradar Index has only 30% of the top 158 stocks in valid up trends. 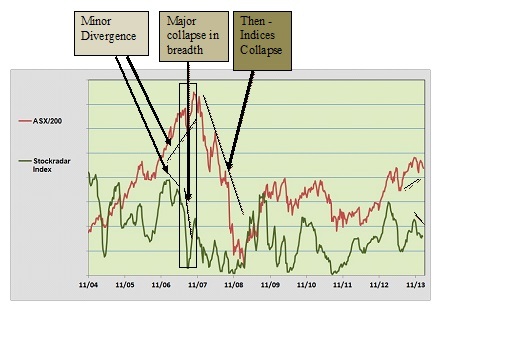 But that may also be because we are not yet in the maturing stage of a bull market, when participation widens.The chart below shows what the Stockradar Breadth Index looked like before the GFC. An extreme change in breadth alerted us to problems well before the collapse in 2008.In summary, be careful when using breadth to measure when to enter and exit a market. There are many micro-issues also playing out. Wait for the extreme changes, which are less likely to provide false signals. /wp-content/uploads/2018/03/logo.png 0 0 Stockradar /wp-content/uploads/2018/03/logo.png Stockradar2014-02-21 00:09:592014-02-21 00:09:59Breadth Indicators - Useful or not? GRAND CANYON DIVERGENCE! While the S&P 500 rockets for the stars, fuelled by massive Fed stimulus, the ASX/200 has had the dead weight of the mining sector hanging around its neck. This has caused a record divergence in the two indices, not seen in decades.Aussie banks have done some of the heavy lifting, accompanied by rising titans such as TLS, FOX, WES, WOW, and CSL, but there’s still a gaping chasm to bridge. Previously, the two tracked a highly correlated path, but since late 2009 the divergence has been unusually wide, as the new cash has chased one of the few raging bulls, the S&P 500. So what could be an outcome? Most likely, the pre-2009 correlation will reassert itself, which might insulate the ASX/200 from further declines, or provide a tailwind in the case of a further advance.